We are a group made up of a mixture of local people and animal protection campaigners with support from celebrities and politicians. We have a core organising group which you can learn more about on our Meet the Team page. Collectively we are campaigning for an end to the sale of puppies at Dogs4Us, a puppy warehouse with branches in Leeds and Manchester. 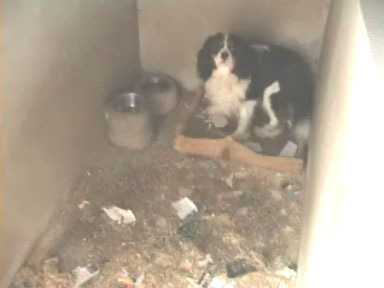 Dogs4Us was exposed on Channel 5 and Sky News in 2009 sourcing puppies from puppy mills that keep breeding dogs in terrible conditions. It was again exposed in 2016 by the BBC Panorama. The Government say you should never buy a puppy unless you see the puppy with their mother. Dogs4Us offer no option to do this. Dogs4Us will not even provide information on the source of their puppies until after purchase, even then the information is minimal. With shelters overflowing with unwanted animals, we ask you not to buy a puppy but rather adopt a rescue. We are calling on Dogs4Us to stop selling puppies immediately. We hold lawful protests at their stores and elsewhere. Please join us. They should be ashamed of themselves!!! This is appalling, they are a disgrace! I rang dogs 4 us yesterday to enquire about their pups. I was told in quite a blunt manner that if I wanted to see the Mother of pups I should go to a private breeder!!!! Also that they wouldn’t give me info of the breeder over the phone, not even a name. I asked that if I came into the store would they give it then to which the phone was put down on me!!! SPEAKS VOLUMES!!! This is not how reputable breeders /companies should be conducting themselves. What a disgrace! Ive reported my concerns to the RSPCA over this matter.